John-Paul Davies is an engaging and dynamic host, moderator, awards presenter and speaker with a voice and presence that exudes warmth and charisma. He has hosted many different major business and charity events. He is also a gifted voiceover artist. He worked for ITV Wales for two years before joining Sky at the start of 2008. Before that he spent four years in the Police becoming the first Police Officer in twenty years from South Wales to gain a place on the Home Office Accelerated Scheme for Graduates. He quickly realised he was dealing with the consequences rather than causes of problems which led him to pursue a long-held desire to become a Journalist gaining a Diploma in Broadcast Journalism from Cardiff School of Journalism in 2005. 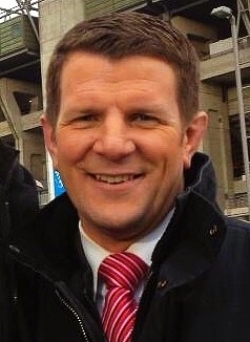 During his first year working for Sky in London, John presented the Rugby League World Cup, International Rugby Union and International Football where he has been the regular presenter for Wales’ Football Internationals. He is a popular and well-known face on Sky News and Sky Sports News and has been an anchor when some of the World’s biggest news stories have broken over the past decade. He has presented many special features including Lions Breakfast and World Cup Verdict and has extensive knowledge of most Sports. He was once a semi-professional Rugby player and is now paying the price although at the time of writing still owns his own set of knees! John has a deep concern for underprivileged people and is committed to a number of charities at home and overseas. He has a heart for raising awareness of mental health and the need for player care in the sport. He is also a factual programme maker of growing repute and has made films drawing attention to global issues in destinations such as Africa and Israel. John loves to travel and History having studied the subject in Aberystwyth where he also taught secondary school history & PE. His experience in the Police and Journalism have enabled him to witness first-hand how a person’s past influences and informs their present and future.